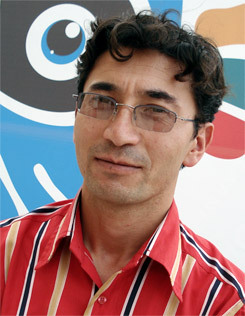 Malek Shafi’i is an Afghan documentary maker. Malek lived in exile for 20 years and returned to Kabul 5 years ago. He launched the Afghanistan Cinema Club and is the organizer of the Autumn Human Rights Film Festival. Malek's films have been seen around the world and been awarded many international prizes. Malek has sat on film festival juries in Canada and Afghanistan. What are some of the challenges of being a filmmaker in Afghanistan? People were not aware of the power of film until the last few years, although cinema has a 60-year history in Afghanistan. Many youth began filmmaking in recent years but there have been security problems that threaten filmmakers. Speaking about problematic social situations through cinema is a new event in Afghanistan. So many organizations that are aware of the power of cinema do not show interest in supporting filmmakers to debate these dilemmas in their films. There are other challenges for Afghan filmmakers as well. The domestic market is not prepared to financially support filmmakers. For people in places like Afghanistan who may not have great opportunities, what advice would you give them about getting into making films professionally? Cinema in Afghanistan is experimental and amateur. However, there are some creative and talented youth involved. I would advise them to expand their links to overseas, to international film festivals and to gradually try to produce films in partnership with outsider producers. This way, they can continue their profession, get new skills and attract more audiences. Favorite documentary (or documentaries) you have seen in the past year and why did you like it/them? I have seen many documentary films! I like those that take you into the depth of events like war, earthquakes, etc. Filmmakers, who go into the depth of such events and capture the affects of them, in fact do great efforts to humanity. I also like ethnographical documentaries. Afghan-produced documentaries are gradually becoming stronger and more attractive. These films provide very valuable information about Afghanistan today, through their critical pictures. A lot of documentaries are now being made in Afghanistan by foreign film makers. Do you think they get your country right or wrong most of the time? Many foreigner filmmakers have a negative image of Afghanistan in their minds. They enter the country with a pre-made judgment and image about Afghanistan and try to make a black image of here as much as they can. They think that it helps them to make a very good story if they focus on showing good - and the bad! But, most of the long feature films produced by Afghans do not have real link with the Afghan society. The short feature and documentary films are the best films – they reflect the realities of the Afghan community. These films capture the country and people exactly how they are and play the role of mirroring our community. Describe some of your films for us please. I have made several documentaries and some of them won prizes. The End of the Earth is about lives of immigrants in Europe at the time of 9/11. This film was in different film festivals and especially won prizes from anti-war film festivals. Pamir Territory is an ethnographical look to people of Wakhan in Badakshan (province). This film was shot during the first presidential election in Afghanistan and won the best documentary award from “Kazan” film festival in Russia. Up to the Parliament is about the lives and campaigns of three women in three different provinces of Afghanistan who are candidates for the first Afghan parliament. My films in fact, reflect an important part of Afghanistan history. Your advice to anyone making a MyView entry? What will you be looking for? I really liked the works of previous MyView competitions, and especially this year’s focus on renewable energy. I think there is a demand for such ideas because human needs today are very similar. So, it will be very good and effective if filmmakers look at the needs of all humans. I hope that this kind of competition continues.